In the 1880s, the Ozark hills around Taney County, Missouri, echoed with the sound of Winchester rifles. Men were lynched from tree limbs by masked night riders. Bundles of switches were tossed on the porches of “loose” men and women as a grim warning to reform or leave the area. In this action-filled saga of the notorious eight-year career of the vigilantes, journalist Mary Hartman and historian Elmo Ingenthron have produced the most comprehensive account of the Bald Knobber era. They trace the roots of the group in the region's border struggles during the Civil War, and examine the organization of anti-Bald Knobbers which sprang up to oppose them. 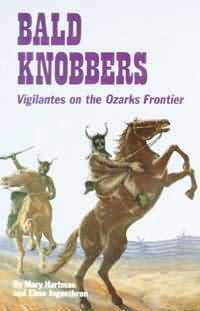 Giant Nat Kinney founded the Bald Knobbers, and led them in their violent campaign for law and order. Andrew Coggburn wrote satirical songs to infuriate Kinney and the other vigilantes. Seventeen-year-old Billy Walker murdered an innocent family and was hanged by the beleaguered authorities. Five opponents of the Bald Knobbers vowed to kill Nat Kinney, and played cards to decide who would do the deed. Elmo Ingenthron was an Ozarks historian, and collected Bald Knobbers lore for more than thirty-five years. Mary Hartman is a veteran journalist and freelance writer.